Back when CMU was Central Normal School, the student council organized events that set one class against another in fierce competition. The student council hoped these events would encourage school spirit and inter-class rivalry. One such competition was known as the Flag Rush. In the early 1920s, the Flag Rush took place in the fall, with freshman and sophomore men battling for the possession of a small flag that had been secured to a pole. The student council each year would supply a telephone pole for the event, which would be set into the ground in a field. The “defenders,” usually the sophomores, would place their flag up on the pole at a height of no more than fifteen feet. The “defenders” would then arrange themselves around the pole, while the “attackers,” usually the freshmen, had fifteen minutes to do all that they could do to steal the flag from the pole. Bleachers were set up around the spectacle for the cheering fans. During this time, freshman males at Central had to wear green caps called “pots” on their head all year. Freshman females had to wear green ribbons. According to early Flag Rush tradition, if the freshman men won the competition they would no longer have to wear their green “pots,” so winning the Flag Rush held a great reward for them. The Frosh would paint their faces green in preparation for the battle. 1. Flag rush to be held annually during the fall term. (a) Sophomores to have the choice of defense or attack if they are outnumbered by ten men or more. In any other case the student council shall decide. (b) Pole to be provided by the student council and to be a telephone pole not less than six inches in diameter. (c) If either class interferes in any way with the pole before the rush they shall be declared losers. (d) Defenders of the pole shall provide the flag. 1. It may be of any description but shall at least measure 18” by 24”. 2. The flag [is] to be fastened on the outside of the pole at a point not more than fifteen feet from the ground. 3. The flag shall be fastened to the pole in such a way that a pull of ten pounds shall remove it. 1. If the defenders are successful in the defense (protection) of the flag for fifteen minutes they shall be declared winners. 2. If the attackers succeed in taking the flag down during the fifteen minutes they shall be declared winners. 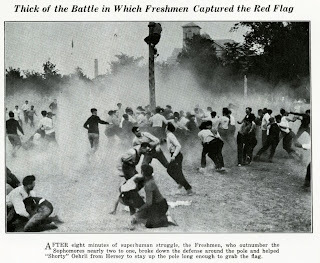 The first annual student council Flag Rush took place in 1923, with the sophomores winning. In 1924, the freshman outnumbered the sophomores two to one, and won the competition. The picture shown here captured the frenzy of that year’s event. Clarke Historical Library serves as the archives for Central Michigan University. Thousands of items are available for patrons to use for researching CMU’s history. To see what is available in the Clarke, search the Libraries’ online catalog Centra.